Over the years many Westerners have enjoyed friendships and physical relationships with Japanese people, only to see themselves either stood up, distanced, or simply coldly forgotten at some point. The experience can sometimes leave the person with a sense of puzzlement or even disenchantment with Japan. Among the many faceless alienated Westerners, however, is a Texan rancher who has spent only a few days in the country; the former President of the USA, George W Bush. 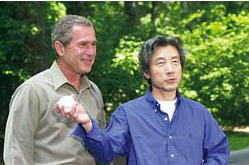 Mr Bush hasn’t heard from his special Japanese friend, Junichiro Koizumi, since they bumped into each other in 2010. “That’s Junichiro. He`s the one holding the ball. I’m standing next to him,” explains Mr Bush unnecessarily as he cradles the “Catchball” picture taken at the media event which bewildered the many people who didn’t want to believe that such powerful men could participate in such a ridiculous, anti-intellectual farce. If nothing else, the stunt brazenly displayed the level of contempt that some World Leaders have for the general public. It has been said that Japanese men don`t do friendship. Some experts even go so far as saying that a typical Japanese heterosexual male-male relationship ends when one person no longer needs the other for their own selfish goals. 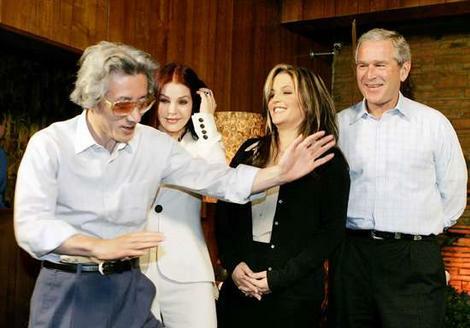 So it goes, it seems, with Bush reaching his use-by date in the eyes of one Junichiro Koizumi. This was all told to me at an exclusive interview at the Bush ranch in Waco. I was surprised at the frankness shown by Mr Bush as he gave me an unprecedented insight into the relationships between leaders after they lose power. During our two hours together, Bush touched on his relationships with Jacques Chirac (“A real man’s man. And he never forgets to send a magnum on my birthday”), Tony Blair (“Warm and charming. He always lets me in for half-price at his lectures”) and Gerhard Schroeder (“The man has never stopped apologizing for failing to get the numbers in order to send German troops to Iraq”). * Mr Koizumi’s office were contacted to get the other side of the story. They responded with a brief e-mail informing that Mr Koizumi hadn’t contacted Mr Bush for two years because he was “busy”. « It’s now official: Curry IS hot!